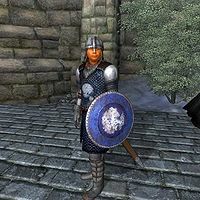 The Bruma Allies are Imperial unique guards who will be sent to aid in the Defense of Bruma during the optional quest Allies for Bruma. 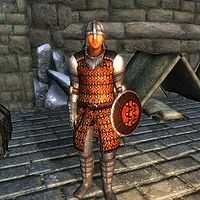 The Counts and Countesses of each city (except the Imperial City) will agree to send soldiers to aid Bruma after the player closes the Oblivion gates threatening their cities. 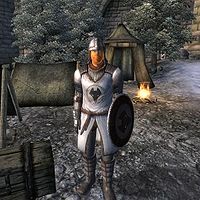 If you have completed The Battle for Castle Kvatch, you can ask Savlian Matius for aid as well. Bravil will not send one of the unique soldiers, but Viera Lerus will be sent unless she has already been killed. Cheydinhal will include Ulrich Leland if he is still Captain of the Cheydinhal guard. 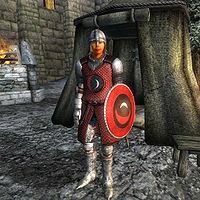 Any soldiers who have been sent to Bruma will set up a camp in front of Castle Bruma and prepare for the coming battle. 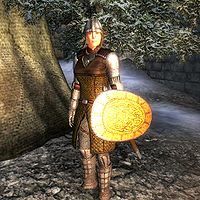 If the player chooses to seek aid from every available city, a total of ten guards may be sent to Bruma: two from Anvil, one from Bravil (Viera Lerus), two from Cheydinhal, two from Chorrol, one from Kvatch, one from Leyawiin, and one from Skingrad. Each soldier is equipped with chainmail boots, gauntlets, and greaves as well as a guard helmet. They each have a cuirass and shield from their respective cities and they wield steel longswords in battle. 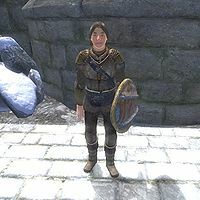 The one exception is the Skingrad guard, who wears steel greaves, boots and gauntlets instead. In addition, each soldier carries a collared shirt, breeches, and a small amount of gold. When you speak to the soldiers for the first time, each one will greet you with a unique statement. Following this, all greetings are drawn from a specific list for MQ13 allies. Each soldier also has a unique hello (triggered as the player approaches) in addition to a generic hello for all MQ13 allies. Unique Hello: "Good to see you, sir/ma'am. We won't forget how you helped Anvil." Unique Greeting: "I always wanted to see the Jerall Mountains. Beautiful, aren't they? Almost makes you forget why we're here." Unique Hello: "You're the one that saved Cheydinhal from that Oblivion Gate, aren't you?" Unique Greeting: "I'm sure you hear it all the time, but I'd like to thank you personally for closing that Oblivion Gate outside Cheydinhal. We were all expecting to become the next Kvatch, you know? With the Count worrying more about his son than the defense of the city, things were looking pretty grim. So, like I said, thanks. I'm glad I was able to come here and do my bit for our side, you know?" Unique Hello: "You don't need to worry about the daedra taking Bruma. 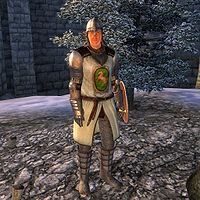 You've got the best soldiers in Cyrodiil here now." Unique Greeting: "The Mythic Dawn won't dare try anything now that the best soldiers in Cyrodiil are defending Bruma!" 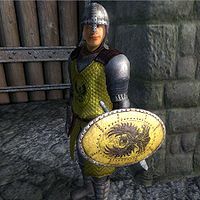 Unique Hello: "I'm looking forward to some payback for what those bastards did to Kvatch." Unique Greeting: "Remember Kvatch, that's our watchword. We won't let that happen here, don't worry." Unique Hello: "How long will Bruma need our help? Count Caro's orders were to return to Leyawiin as soon as Bruma was secure." Unique Greeting: "I can't stay long. Count Caro's orders were to return to Leyawiin as soon as Bruma was safe." Unique Hello: "I can't wait to get back to Skingrad. I ain't cut out for this damned weather." Unique Greeting: "Is it always this cold up here? This weather would freeze the arse off an ogre." These are used instead of any guards that are not recruited. Each will wield either an iron shortsword, an iron war axe, or an iron battle axe. They will always have a coarse linen shirt and a leather cuirass. 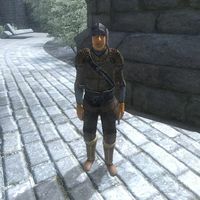 Bruma Militia will have fur boots 75% of the time and leather boots 25% of the time. They will have fur greaves 66% of the time, and leather greaves 33% of the time. They will also have an additional piece of armor out of the following: fur helmet, fur shield, leather helmet, leather shield, iron helmet, iron shield. They will have a handful of gold coins as well. Both have two greeting lines: "I wish we had more real soldiers." and "We'll stand our ground as long as we can." During Martin's speech, they will shout "For Bruma!" This page was last modified on 12 March 2017, at 21:56.